But we'll forgive you if you've never heard of them, they are pretty hidden! 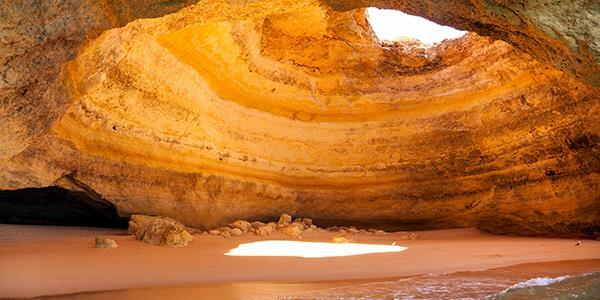 The Algarve is well known for its incredible coastal rock formations, and the Benagil caves are no exception. 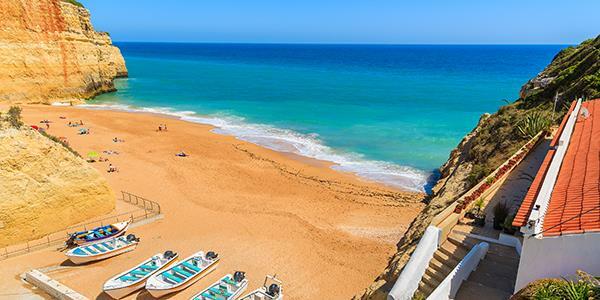 They are located close to the little fishing village of Benagil, along the coast just slightly to the east of Rocha Brava. There are many isolated beaches along the Lagoa coast and though these particular caves are only 150m from the village's main beach, the only way to reach them is via the water. Boat trips depart from the Benagil beach to take visitors there, but if you're a strong swimmer and the sea is calm enough (only if the sea is calm enough!) you can enjoy swimming to them. For something a little different, why not experience views of these incredible caves at a slower pace and paddleboard through them? The Benagil caves have an otherworldly feel to them. This system of picturesque grottos has been hewn from the colourful Algarve rock and now they shelter small hidden sandy coves and gently lapping waves. Natural caves and arches have formed over time and they're now a really popular attraction. From Rocha Brava you can drive the 10 minutes east dow the M1273 and in to the village of Benagil. There is only limited parking, but you may be able to find a space on the road. It is from the beach that the boat trips depart and these will take you on an excursion around several different cave systems along this stretch of coast. They are popular excursions, so do bear in mind they may book up quickly, especially in the summer months.